The day we received the horrible news that our Hannah was “incompatible with life” at maternal/fetal medicine my doctor made time to see us right away. I thought I would receive options… some type of hope, but I didn’t. I felt pressured and unsupported. I was in shock by this horrible news and being told to terminate I could barely talk. However, once my doctor knew that termination was not an option it was never brought up again. My doctor is one of the few prolife doctors in my area. I was never questioned, pressured, or judged by my doctor. My doctor kept an extremely close eye on me because of the serious risk of mirror syndrome. She did everything in her power to make sure I was safe and healthy as I carried Hannah for as long as I could. **Termination to my doctor was inducing me early with no doctor intervention with the baby either way. However, I feel that is still wrong, because I would be choosing to end my baby’s life. She is a wonderful doctor. I am so incredibly blessed to have her as my doctor. I have read so many horror stories of just mean, rude, judgmental, and unsupportive doctors. I can’t imagine if mine was like that. She’s blunt and to the point, but not mean and cold at all. She genuinely cares about her patients and their babies. She is available anytime and gives out her cell phone number to her patients. Victoria and I both have her as a doctor. We have both called and texted her numerous times with questions or concerns we have. My doctor made sure that I had a private room and was not taken to the maternity wing. Last week I finally sat down to write my doctor a thank you note. It has taken so long and it’s not because I didn’t want to but because I was afraid to. 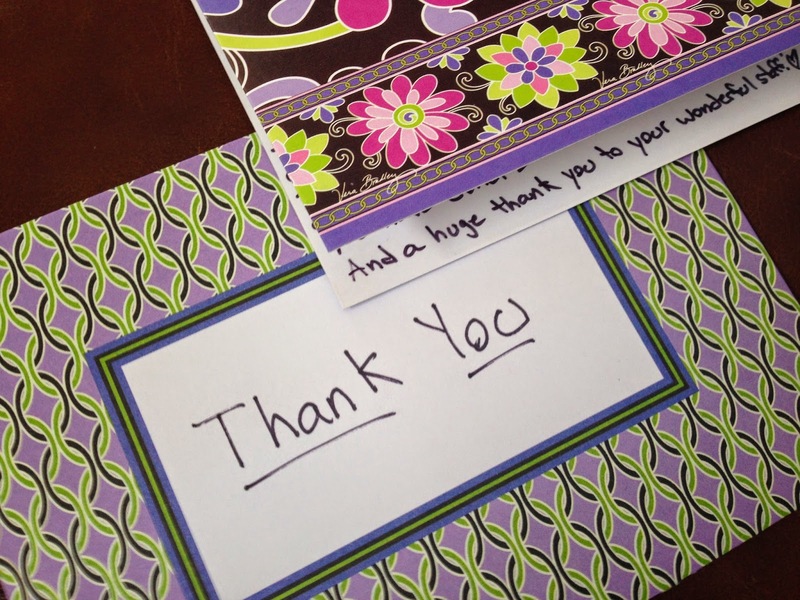 I was dreading the emotions that would be triggered by thanking my doctor for so much that she had done. I would need to go back to the worst day of my life. But I sucked it up, I picked out pretty stationery and sat down to write. I started then got stuck. I started again then started to cry and had to walk away. On the third time I finally was able to finish it. I included the prayer card from Hannah’s funeral and a picture of Hannah and I. This Thank You note is long overdue. I apologize for that. I just wanted to thank you for everything. Thank you for supporting my decision to carry Hannah. Thank you for taking care of me and keeping me safe. Thank you for always making yourself available if I have any questions or concerns. Thank you for your support, sympathy, and for caring so much. Thank you for baptizing Hannah. Thank you for respecting Jason and I as her parents and her as our baby and child. Thank you for ensuring our privacy at the hospital. Thank you for allowing our parents and siblings to be there. I truly thank you for all you have done. I’m so blesses to have you as my Doctor. And a huge thank you to your wonderful staff.